On any e-commerce website, it is important to understand and test your Checkout process to ensure that everything is working as expected. One of the best ways to do this is to place a test order. If there is an issue on your site, an important troubleshooting step for you to take is to place a test order. By placing a test order, you can walk through every step of the Checkout process on your website just as a visitor would without having to provide any actual payment information! Log in to your Site Manager. Once you've logged in to the Site Manager open your website in a new tab. Click "Add to cart" for any item. Click View Cart and proceed through the checkout process until you've reached the Payment Details page. 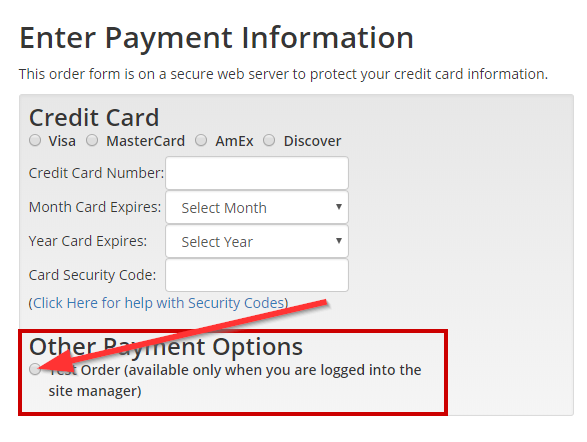 Click "Test Order" instead of the Credit Card (or any other applicable other) option(s). Click "Submit" to submit your order as you would normally. If the test order was a success, you will receive a confirmation email and you will have a new entry at the top of your Order Manager. If you place a test order and it is unsuccessful, please contact HEROweb support immediately with a description of the issue, the specific error message you are receiving, the browser/device you are using, and the page you are on when you get the error. If you need to verify that your the credit card payment processor is working, then you will need to submit an order using a live credit card transaction and then void the transaction. If the payment is submitted & received, this indicates that your payment processor is be working great with no problems detected. In either situation, void the transaction after you review the result, and this will tell your payment processor to remove any authorizations/charges placed on your card.